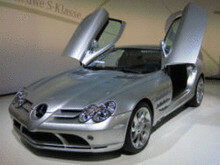 The Mercedes-Benz SLR McLaren is an Anglo-German sports car jointly developed by Mercedes-Benz and McLaren Automotive. Built in Portsmouth and the McLaren Technology Centre in Woking, Surrey, England. Daimler AG, owner of Mercedes-Benz, also owns 40% of the McLaren Group. Classified as a sports car and compared to cars like the Porsche Carrera GT and Enzo Ferrari, the presence of the automatic gear box, front mid-engined arrangement and its driving characteristics lead some commentators to classify the SLR McLaren as a Super GT whose closer rivals are the Aston Martin V12 Vanquish and Ferrari 599 GTB. One of the goals of the SLR was to combine both sports car and GT characteristics. It is the fastest automatic transmission car in the world. SLR stands for "Sport, Leicht, Rennsport" (sport, light, racing). Mercedes-Benz has stated that they will build 3500 SLRs in a span of 7 years, with an annual production of only 500 cars. The car's base price is GB£300,000 (approx. US$495,000 or €475,000, c. 2007). 8' 10" 0' 0" 0' 0" 15' 3" 6' 3" 0 (0) 0' 0"